An attempt to provide better “access” on the European Tour for Challenge Tour and Qualifying School graduates has been welcomed by David Drysdale, who has chiselled away at the coalface on both circuits for the past 17 seasons. The new Access List, which starts next week as the 2017 campaign begins in both Australia and South Africa, will run concurrently with the Race to Dubai but excludes money earned in the Rolex Series events, the Masters, US PGA Championship and the four WGCs. The Open and US Open will both count for Access List purposes due to the fact that all European Tour members have an equal opportunity to pre-qualify for those tournaments. The top 10 on the Access List at the end of the season, not otherwise exempt from the final Race to Dubai, will then retain their cards for the following season. Consequently, the number of players retaining full membership from the Race to Dubai will be reduced from 110 to 100. 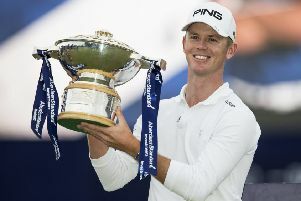 The top performing players on the Access List will also be given the chance to compete in the Rolex Series, with the leading three at the time getting into the BMW PGA Championship, the Irish Open and the Italian Open. “I think the Access List is good in that Challenge Tour and Q School graduates will now get a chance to play more,” said Drysdale, who paid 10 visits to the Qualifying School in 11 years before establishing a foothold on the European Tour, where he’s now held on to his card for eight seasons in a row off the money-list.